CryoAblation allows a doctor to test an ablation before making it permanent. Heart tissue can be slightly frozen to test whether it is responsible for producing A-Fib signals. That tissue can then be re-warmed and restored to its normal electrical function. Heat-based therapies like RF don’t allow that—once the heart tissue is burned, it stays burned. With CryoAblation there is less risk of damaging other areas of the heart or esophagus. With CryoAblation there is less risk of damaging other areas of the heart or esophagus. Often in catheter ablation doctors have to work close to critical structures such as the heart’s pacemaking system, the esophagus, or the coronary arteries. For example, an RF ablation in the wrong spot can block the normal electrical conduction in the heart and require the surgical insertion of a permanent pacemaker. With CryoAblation (which freezes tissue instead of ablating it), the risk of damage to critical structures in minimized. CryoAblation minimizes the risk of perforation. Because CryoAblation preserves heart tissue integrity rather than burning it, there is minimal risk of perforation. For example, a CryoAblation catheter is less likely to perforate the atrial wall. With CryoAblation there is little or no discomfort or pain during the procedure. Like putting a cold pack on a pulled muscle, the freezing acts as a natural anesthetic. With CryoAblation there is less risk of Stenosis (swelling). An RF ablation in the Pulmonary Vein openings can sometimes result in Stenosis (swelling or narrowing of the Pulmonary Vein opening) which restricts or blocks blood flow. Since CryoAblation does not burn and instead preserves heart tissue integrity, there is less risk of Stenosis. When cold temperatures are applied, CryoAblation catheters stick to the heart tissue they touch, much like a tongue on cold metal. Since the heart is beating and in constant motion during an ablation, this is a significant advantage over RF. The ability of the CryoAblation catheter to stick to the exact spot to be ablated, helps the doctor avoid any accidental slips of the catheter tip, thereby preventing damage to nearby critical structures. CryoAblation produces no crust formations. RF burns can cause a crust to form over the ablated area (called a “thrombus”). This crust can fall off and lodge in a blood vessel, perhaps causing a blood clot and stroke. (That’s one of the reasons blood thinners like heparin are used during RF ablations, to prevent these blood clots.) With CryoAblation, this risk of thrombus is minimized. Ablating using the CryoCath balloon catheter appears to be faster and easier, as well as safer than RF. A 2008 study described long-term data involving 346 patients with Paroxysmal (393) or Persistent (53) A-Fib. Following one Cryoballoon ablation, 74% of Paroxysmal patients were free of A-Fib and in permanent sinus rhythm. 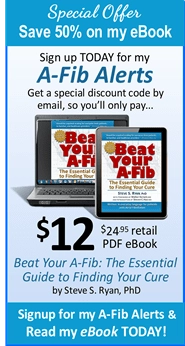 But this figure was much lower for those with persistent A-Fib―just 38%. There were no strokes, no pulmonary vein stenosis, no esophageal injury, and no coronary artery injury as sometimes occurs with RF ablation (RF ablations typically have a major complication rate of around 4%). A 74% cure rate for the CryoCath balloon catheter is similar cure rates for RF ablations for Paroxysmal A-Fib. 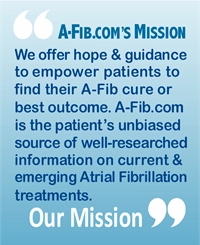 The low 38% cure rate for Persistent A-Fib might be due to only having one ablation. 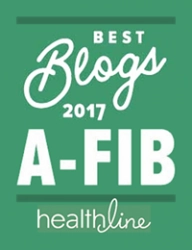 Most RF ablation procedures for Persistent A-Fib now require two or more ablations. 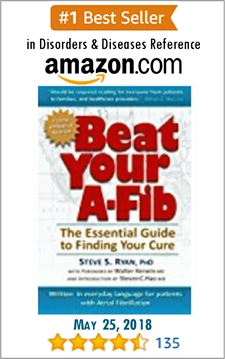 (See: 95% Success Rate in Curing Persistent A-Fib/Boston A-Fib Symposium 2007.) Also, in this study only the Pulmonary Vein openings were treated with the CryoCath balloon catheter. They did not attempt any other lines or lesions as is commonly done with RF ablations for Persistent A-Fib. 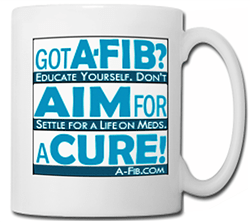 Persistent A-Fib is more complex and difficult to cure. As doctors get more experienced with CryoAblation, they may well be able to achieve similar success rates as RF for Persistent A-Fib. In the future we may see centers first use Cryoballoon catheters to isolate the Pulmonary Veins because it is safer, easier, and uses less fluoroscopic exposure; and secondly use RF or non-balloon Cryo catheters for linear lesions and to target other areas of the heart in more complex cases of Persistent A-Fib. CryoAblation is already being used to ablate near the esophagus to prevent Atrial-Esophageal Fistula. Cryoballoon catheter ablation may also be the answer to the problem of re-do’s. All too often RF ablation patients have to return for a second ablation, because of re-growth and reconduction of the RF ablated areas, and because PV isolation with RF is difficult to achieve in a uniform fashion, even with experienced operators. Circumferential ablation with small-tipped catheters often results in gaps in the lesions lines and uneven scar formation. The Cryoballoon catheter ablation may solve this problem because of its ability to easily and quickly produce uniform pulmonary vein isolation. The Cryoballoon catheter looks to be a major improvement in the treatment of A-Fib with close to 100% success rate in isolating the PVs, and 75-80% success in keeping patients free of A-Fib without anti-arrhythmic drugs. 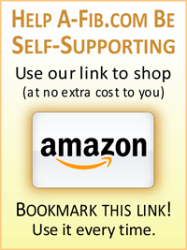 Doctors have been doing RF ablations for years. It works. The Cryoballoon and RF catheter ablations are pretty much equally effective. The Cryoballoon is safer, but not that much safer than RF which is a low risk procedure. If I had a choice between the Cryoballoon and RF, I’d probably choose the Cryoballoon. But a RF ablation remains a good option with a high success rate and low complication rate.